(CNN) - CNN projects that Maryland Lt. Gov. 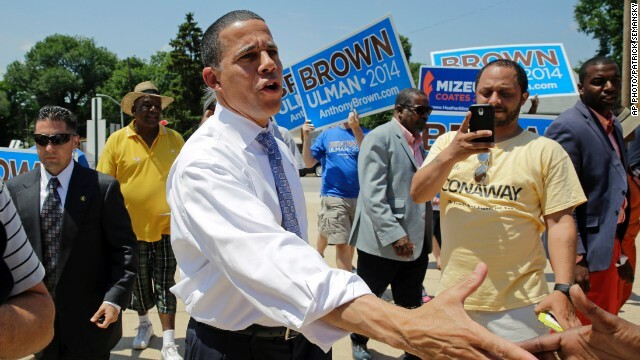 Anthony Brown will win the state's Democratic gubernatorial primary. In a state dominated by Democrats, Brown will now be considered the favorite to win the general election in the race to succeed term limited Democratic Gov. Martin O'Malley. Brown was backed by O'Malley, a potential 2016 Democratic presidential candidate, as well as former President Bill Clinton. "As a son of immigrants, a 30-year Army veteran who served his nation in Iraq, and Lieutenant Governor, Anthony's life experiences have prepared him to lead his state," said Vermont Gov. Peter Shumlin, chairman of the Democratic Governors Association, in a statement. Congrats. That was pretty much a given. The fact that he received 51% of the votes running against three others and the rethugs only received 43% running against one person pretty much tells you who are next governor is going to be. What happend to the MAMMA HOG Jionnie erest??????? Looks Like Barack, doesn't he?